Florida State quarterback Everett Golson will sit out today's game against Syracuse due to concussion-like symptoms. 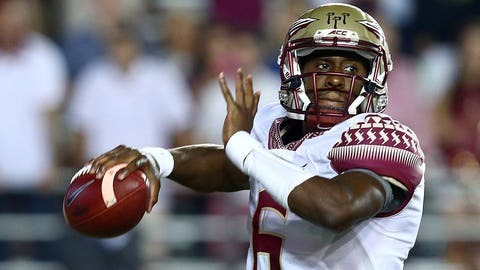 Florida State quarterback Everett Golson will be sidelined for today’s game against Syracuse due to what the school is calling concussion-like symptoms. Backup Sean Maguire will take his place when the No. 17 Seminoles (6-1, 4-1 ACC) kick off against Syracuse (3-4, 1-2 ACC) today at noon. On the season, Golson has connected on 67.2 percent of his passes for 1,659 yards and 11 touchdowns. The loss of Golson is the second big blow for the FSU offense, which will also be without star RB Dalvin Cook because of an ankle injury.